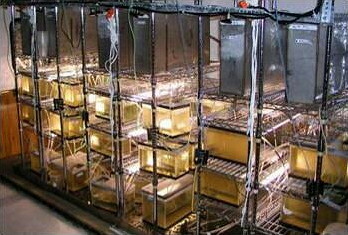 Fish tanks inside an onsite laboratory where fathead minnows were exposed to untreated and treated wastewater for 28 days to test for possible endocrine disruption. Photo credit: Alan Vajda, University of Colorado. 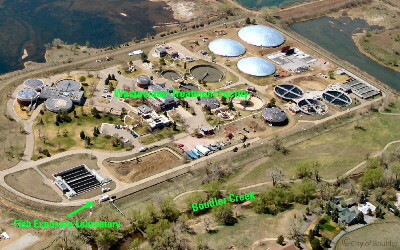 A team of scientists from the U.S. Geological Survey (USGS), the University of Colorado, and the City of Boulder, Colorado, demonstrated that improvements to the treatment process at a wastewater treatment facility (WWTF) reduced the level of endocrine disruption in fish exposed to wastewater effluent discharged from the facility. It is difficult to anticipate the effects that upgrading WWTF operations might have on stream ecosystems. In a recent article in Environmental Science and Technology the scientists report on a multiyear experiment to evaluate the impact on wastewater quality of a major ($45 million in cost) upgrade to the Boulder, Colorado, WWTF. The facility was converted from a biological filter plant with solids contact to an activated sludge plant. In 2005 and 2007 the scientists established the water-quality conditions and level of fish endocrine disruption in test organisms before the upgrade. A similar set of investigations was conducted in 2008 and 2011 to document conditions after the upgrade. The two studies evaluated a wide variety of organic and inorganic contaminants and tracked their concentrations through the various treatment processes. Fish endocrine disruption was measured during controlled, 28-day onsite continuous-flow exposure experiments using different dilutions of wastewater. The fish experiments used sexually mature male fathead minnows and multiple indicators of endocrine disruption (biomarkers). 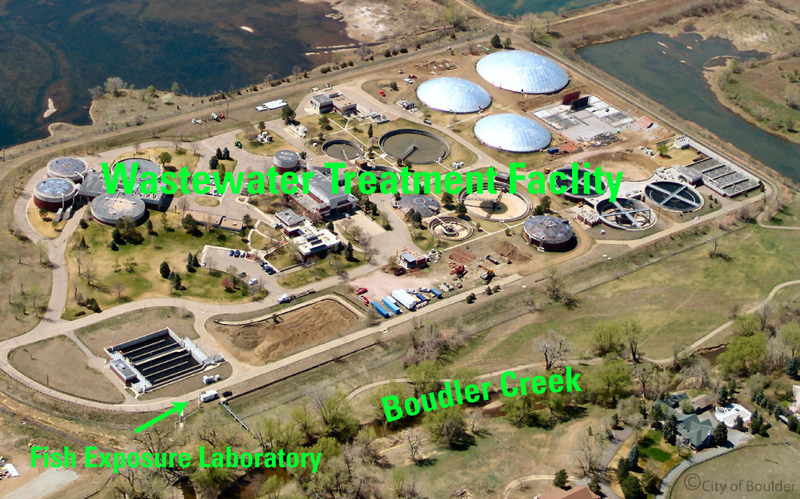 The Boulder Wastewater Treatment Facility, Colorado (circa 2005), before the upgrade to an activated sludge treatment process. Treated effluent from the plant is discharged to nearby Boulder Creek. In a small laboratory, seen in the lower left of the photograph, a team of scientists conducted fish exposure experiments using the treated effluent from the facility. Photo Credit: City of Boulder, Colorado. The scientists found that the WWTF upgrade resulted in enhanced removal of hormones (steroidal estrogens) and other endocrine disrupting compounds from the wastewater, as well as a decrease in fish endocrine disruption. This study was funded by the USGS Toxic Substances Hydrology and Hydrologic Research and Development Programs, and the National Science Foundation. Barber, L.B., Vajda, A.M., Douville, C., Norris, D.O., and Writer, J.H., 2012, Fish endocrine disruption responses to a major wastewater treatment facility upgrade: Environmental Science and Technology, v. 46, no. 4, p. 2121-2131, doi:10.1021/es202880e. Vajda, A.M., Barber, L.B., Gray, J.L., Lopez, E.M., Bolden, A.M., Schoenfuss, H.L., and Norris, D.O., 2011, Demasculinization of male fish by wastewater treatment plant effluent: Aquatic Toxicology, v. 103, no. 3-4, p. 213-221, doi:10.1016/j.aquatox.2011.02.007.